There are times when we all need to focus. Whether it be studying, working, or even getting a good night sleep, having our phone on causes distractions. Even slight vibrations from a Facebook message or text can awaken the deepest sleeper and result in a bad night’s rest. 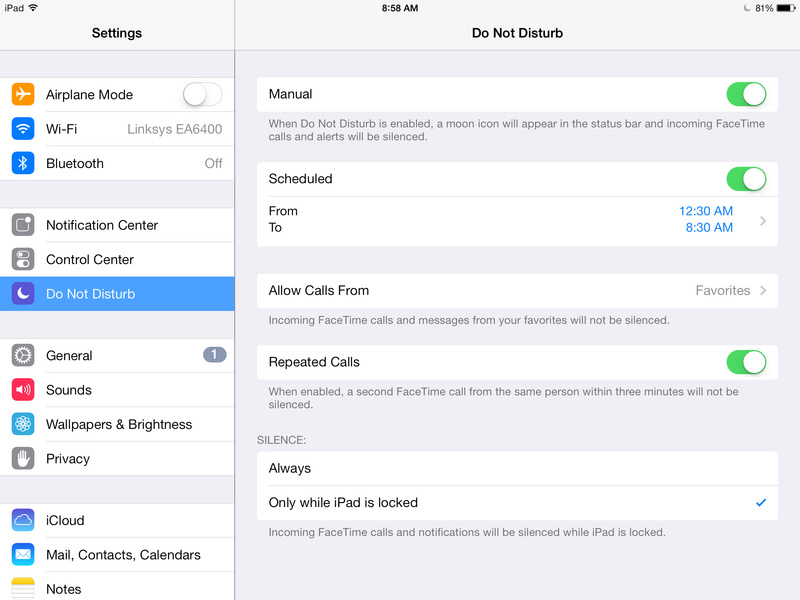 Do Not Disturb is one of the most underrated and unknown features currently on iOS devices. After working in an iPhone diagnostics and repair position, I found Do Not Disturb related issues were near the top. Consumers would come in demanding to have their “broken” iPhone replaced because they weren’t receiving calls or emails. From a quick glance, I would notice the little moon near the clock and explain the situation. It would become activated by accident and permanently enabled, silencing all alerts and calls. While this feature can seem unwanted, it does bring plenty of benefit. Do Not Disturb was first introduced in iOS 6. Hidden within the Notification Center, it brought trouble for some users who didn’t have a good sense of the operating system. When Apple released iOS 7, the feature was given it’s own dedicated menu tree within the Settings app. Located a few rows down, it gives you a full list of customization options when opened. The first option, Manual, enables the feature permanently until it’s turned off again. This setting is good to have for meetings, study periods, work shifts, or interviews. It will completely silence the device from sounds and vibrations. The display will also stay off if an alert is received. Do Not Disturb will place a crescent moon icon beside the battery indicator when activated. There is also a toggle that will enable it from the Control Center in iOS 7. This helps when small periods of silence are needed. A scheduling feature is also available, allowing you to set a custom period for Do Not Disturb to be activated. Alerts will still come through but you can continue to get a good night’s rest. In case of emergencies, calls are still able to come through. The Allow Calls From option can be set to Favourites, which is located on the far left tab inside the Phone app. Everyone will allow calls from any number and No One will block them all. Repeated Calls will pass through a second call if it’s made within 3 minutes. The last option will temporarily disable Do Not Disturb when the device is unlocked. If you are browsing Safari or checking e-mail and an alert comes through, the device will ring or vibrate and be silenced only when locked. These settings can be adjusted at any time, making this feature beneficial for everyone. I’ve had a schedule set for Do Not Disturb since it’s original release in iOS 6. It’s one of my favourite hidden features and helps me stay focused when I need to be.